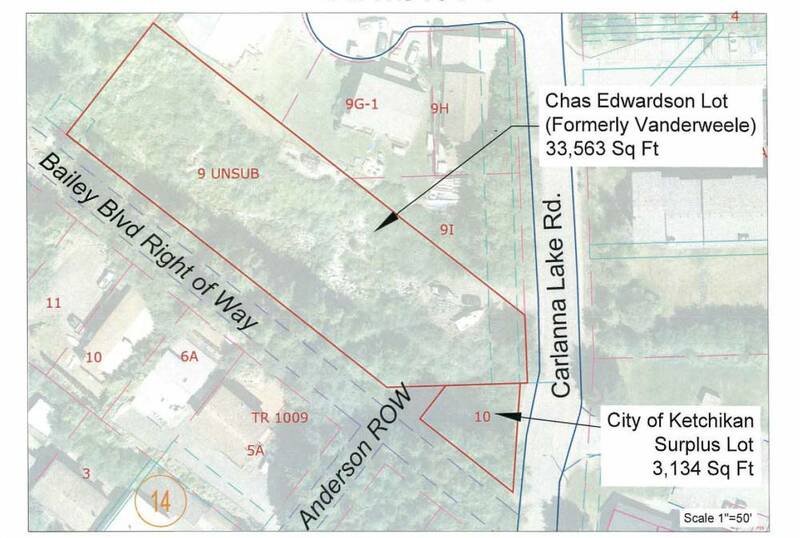 The Ketchikan City Council voted unanimously Thursday to move forward with selling a city-owned lot on Carlanna Lake Road to a local developer for $500. The approximately 3,100-foot irregular-shaped lot has been in city ownership since 1975, and Chas Edwardson is the only person to ever express interest in purchasing it. The lot is assessed at $10,000. Edwardson owns adjacent undeveloped property, and plans to develop the entire site for housing. He told the council that the city’s lot is not worth the assessed value, and is primarily useful for drainage. During council discussion, most council members agreed that it’s better to get the property on the tax rolls. Sam Bergeron said until now, nobody has had any interest in it. Council Member Julie Isom was concerned about setting a precedent. She said she owns a house on a sub-sized lot, and there’s a vacant city-owned piece of property next to her house. Isom said she’d pay $500 to make her lot a standard size, and other people probably are in a similar situation. Others, though, said this particular lot is unique. It’s basically a drainage ditch, said Public Works Director Mark Hilson. “There’s a drainage pipe that enters the lot, and the water spreads out and goes through it,” he said. The council voted unanimously to direct city management to draft an ordinance authorizing the sale of the lot to Edwardson for $500. The ordinance will come back to the council for approval, and will require a minimum of five votes to pass. Also Thursday, the council voted unanimously to protest a liquor-license renewal application from the Moose Lodge. The protest is based on unpaid sales taxes and building-code violations. Bill Meck of the Moose Lodge told the council that they have applied for a bank loan, but the membership needs to vote on that. He said they also are working with a local business to get the water pipes under the building fixed. If the problems are resolved before April 22, the city can withdraw the protest. The next Ketchikan City Council meeting is April 22. That is rescheduled from the regular meeting day of April 18t, because the manager and some of the council will be out of town.